It's 11:16 at the Stelvio Pass, Italy right now. Albergo Quarto Pirovano A view of the Albergo Quarto Pirovano, the triangular building in the center of the image. 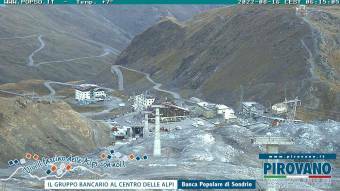 Stelvio Pass: Several Webcams, 0 miles away. Stelvio Pass: La Terrazza di Pirovano, 0 miles away. Stelvio Pass: Albergo Quarto Pirovano, 0 miles away. Stelvio Pass: La Punta degli Spiriti, 0 miles away. Stelvio Pass: Panorama View, 0 miles away. Stelvio Pass: Alpeggio delle Rese Basse, 0 miles away. Stelvio Pass: View towards the Valle del Braulio, 0 miles away. Trafoi: View towards Mount Ortler, 3.1 miles away.